Roque Santa Cruz headed his first goal for Manchester City as Mark Hughes's side thrashed Scunthorpe to reach the Carling Cup quarter-finals. Stephen Ireland gave City the lead with a curling shot before Jonathan Forte slotted in an equaliser for the Iron. Santa Cruz converted Pablo Zabaleta's cross before Joleon Lescott headed home a Shaun Wright-Phillips corner. Carlos Tevez prodded in from a Vladimir Weiss pass and Michael Johnson sealed a resounding win with a 25-yard drive. City's victory ended a run of three straight draws on a night when Hughes was able to show off some of the impressive resources at his disposal. Santa Cruz lasted the full 90 minutes on his first start since his £17.5 million move from Blackburn, while Johnson and Benjani were given useful run-outs following long-term injury layoffs. Another player who has been short of first-team action this term, teenager Vladimir Weiss, could have scored a hat-trick in an impressive late cameo. City wasted little time in asserting their authority over the Championship side. With just three minutes on the clock, Wright-Phillips found Ireland and the midfielder was allowed to cruise to the edge of the box before calmly guiding the ball past Joe Murphy. Wright-Phillips missed two chances to extend City's lead before Scunthorpe levelled things with an well-worked goal. Nigel de Jong gave the ball away in midfield, and it was swept out to Marcus Williams on the left. His clever pass left Forte with a simple close-range finish. Nigel Adkins's side carried the fight to City during an impressive spell and could have gone ahead when Paul Hayes forced a smart save from Shay Given. But City took the lead before the break when Zabaleta sprinted down the left and crossed to the far post for Santa Cruz, who planted a header across Murphy into the far corner. Lescott gave City breathing space with his second goal in as many games before Weiss was sent on for his full debut in place of Ireland. The 19-year-old was immediately into the thick of the action, teeing up Tevez for his fourth goal of the season. Moments later, the young Slovakian collected the ball on the half-way line and beat three players before scuffing his shot. City were rampant and substitute Johnson sealed an emphatic win with a rising strike into the top scorner. Tevez received a standing ovation as he was replaced by Benjani, who was making only his third appearance of 2009 following a string of injuries. "There were lots of positives to come out of the game when we played with the necessary intensity and tempo that made it difficult for Scunthorpe. "We put on plenty of pressure and in the end they were not able to cope with it and we ran out comfortable winners. "We wanted to finish the tie off and not repeat the draw against Fulham." "City have made it clear they want to win this tournament by the strength of the side they put out. "If they had turned out a weakened side they could have come unstuck. We played well and created a lot of chances. "But the quality of City shone through in the second half, the workrate was phenomenal and a lesson to our lads." 90:00+3:58 The match has reached full-time. 90:00+2:59 Pablo Zabaleta concedes a free kick for a foul on Jonathan Forte. Martyn Woolford takes the free kick. 84:58 Pablo Zabaleta has an effort at goal from just inside the box that misses to the right of the target. 83:56 Shot on goal by Paul Hayes from just inside the area goes over the target. 83:17 Josh Wright takes the direct free kick. 83:17 Booking The referee shows Pablo Zabaleta a yellow card. 83:02 Pablo Zabaleta challenges Paul Hayes unfairly and gives away a free kick. 81:48 Free kick awarded for an unfair challenge on Shaun Wright-Phillips by Cliff Byrne. Silvio Sylvinho takes the free kick. 81:09 Shot by Vladimir Weiss from deep inside the penalty area misses to the right of the goal. 78:53 Substitution (Man City) makes a substitution, with Benjani Mwaruwari coming on for Carlos Tevez. 78:28 Josh Wright crosses the ball from the free kick left-footed from left channel, clearance by Vladimir Weiss. 78:28 Booking The referee books Nigel De Jong for unsporting behaviour. 78:24 Foul by Nigel De Jong on Josh Wright, free kick awarded. 76:54 GOAL - Michael Johnson:Man City 5 - 1 Scunthorpe Michael Johnson fires in a goal from outside the box to the top right corner of the goal. Man City 5-1 Scunthorpe. 76:20 Vladimir Weiss takes the outswinging corner, Cliff Byrne makes a clearance. 76:17 Substitution (Scunthorpe) makes a substitution, with Sam Togwell coming on for Grant McCann. 75:26 Corner taken by Josh Wright from the left by-line played to the near post, clearance by Pablo Zabaleta. 72:54 Michael Johnson has an effort at goal from outside the box which goes wide left of the goal. 72:15 Substitution Gareth Barry leaves the field to be replaced by Michael Johnson. Correction - 71:43 Substitution Gareth Barry leaves the field to be replaced by Michael Johnson. 70:30 Assist on the goal came from Vladimir Weiss. 70:30 GOAL - Carlos Tevez:Man City 4 - 1 Scunthorpe Goal scored by Carlos Tevez from close range high into the middle of the goal. Man City 4-1 Scunthorpe. 67:06 Joe Murphy takes the indirect free kick. 67:06 Substitution Gary Hooper joins the action as a substitute, replacing Michael O'Connor. 67:06 Roque Santa Cruz is ruled offside. 64:37 Free kick awarded for a foul by Jonathan Forte on Vincent Kompany. Pablo Zabaleta takes the direct free kick. 64:09 Shaun Wright-Phillips takes a shot from just inside the penalty box which clears the bar. 58:33 Substitution Stephen Ireland leaves the field to be replaced by Vladimir Weiss. Correction - 58:07 Stephen Ireland takes a shot. Niall Canavan makes a clearance. 58:07 Stephen Ireland takes a shot. David Mirfin manages to make a clearance. 57:03 Carlos Tevez takes a shot. Save by Joe Murphy. 55:53 Assist on the goal came from Shaun Wright-Phillips. 55:53 GOAL - Joleon Lescott:Man City 3 - 1 Scunthorpe Joleon Lescott scores a headed goal from inside the area. Man City 3-1 Scunthorpe. 55:30 The ball is sent over by Carlos Tevez, clearance made by David Mirfin. 54:25 Roque Santa Cruz takes a shot. Save made by Joe Murphy. 51:51 Corner taken left-footed by Gareth Barry. 51:40 Carlos Tevez takes a shot. Blocked by David Mirfin. 47:27 Grant McCann fouled by Nigel De Jong, the ref awards a free kick. The ball is crossed by Grant McCann, Martyn Woolford takes a shot. Shay Given makes a save. 45:24 Roque Santa Cruz produces a right-footed shot from just outside the area that goes harmlessly over the target. 45:01 Substitution Rob Jones leaves the field to be replaced by Niall Canavan. 45:00+1:21 The first half comes to an end. 45:00+0:10 Paul Hayes has an effort at goal from a long way out that goes wide left. 40:41 Shaun Wright-Phillips takes a short corner. 40:03 Jonathan Forte concedes a free kick for a foul on Nigel De Jong. Free kick taken by Nigel De Jong. 38:51 Handball decision goes against Jonathan Forte. Shay Given restarts play with the free kick. 37:38 Assist by Pablo Zabaleta. 37:38 GOAL - Roque Santa Cruz:Man City 2 - 1 Scunthorpe Roque Santa Cruz grabs a headed goal from inside the penalty box. Man City 2-1 Scunthorpe. 36:29 Free kick awarded for a foul by Vincent Kompany on Jonathan Forte. Free kick crossed right-footed by Michael O'Connor, clearance made by Silvio Sylvinho. 33:13 The ball is swung over by Shaun Wright-Phillips, save by Joe Murphy. 30:49 Paul Hayes produces a right-footed shot from the edge of the area and misses to the left of the goal. 29:59 Foul by Nigel De Jong on Grant McCann, free kick awarded. Free kick crossed by Grant McCann, clearance made by Stephen Ireland. 29:17 Shaun Wright-Phillips takes a shot. Save made by Joe Murphy. 28:57 Paul Hayes takes a shot. Shay Given makes a save. 27:56 Shaun Wright-Phillips takes a inswinging corner. 25:28 The assist for the goal came from Marcus Williams. 25:28 GOAL - Jonathan Forte:Man City 1 - 1 Scunthorpe Jonathan Forte scores a goal from close range low into the middle of the goal. Man City 1-1 Scunthorpe. 23:53 Free kick awarded for an unfair challenge on Vincent Kompany by Jonathan Forte. Shay Given takes the direct free kick. 23:07 Roque Santa Cruz is caught offside. Rob Jones takes the indirect free kick. 17:37 Cliff Byrne challenges Gareth Barry unfairly and gives away a free kick. Gareth Barry takes the direct free kick. 11:55 The referee gives a free kick against Pablo Zabaleta for handball. Direct free kick taken by Joe Murphy. 8:56 Corner taken by Gareth Barry, Joe Murphy makes a save. 8:27 Rob Jones gives away a free kick for an unfair challenge on Roque Santa Cruz. Gareth Barry takes the free kick. 7:25 Shaun Wright-Phillips produces a right-footed shot from just outside the box that goes wide left of the goal. 4:48 Paul Hayes is caught offside. Shay Given takes the indirect free kick. 4:31 Foul by Nigel De Jong on Grant McCann, free kick awarded. Direct free kick taken by Grant McCann. 3:43 Effort on goal by Shaun Wright-Phillips from just outside the area goes harmlessly over the target. 2:23 GOAL - Stephen Ireland:Man City 1 - 0 Scunthorpe Stephen Ireland finds the back of the net with a goal from just outside the penalty box to the bottom right corner of the goal. 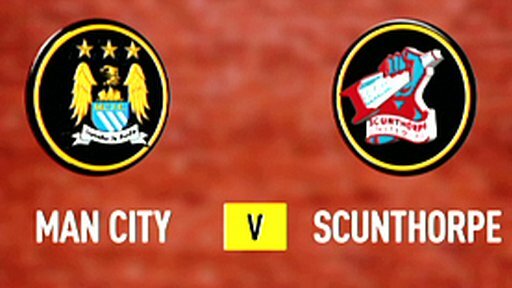 Man City 1-0 Scunthorpe. 2:20 Assist on the goal came from Shaun Wright-Phillips. 1:11 Paul Hayes takes a shot. Shay Given makes a save.